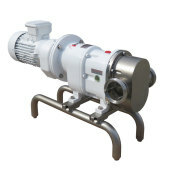 The SLR pump is a positive displacement rotary lobe pump with sanitary design suitable for use in the dairy, food-processing, beverage, cosmetics, pharmaceutical and fine chemicals industries. 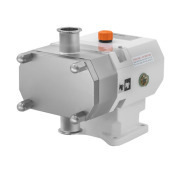 This sanitary lobe pump is perfect for managing all kinds of fluid, of either low or high viscosity, as well as for filtering and bottling applications. Products containing fragile solids such as curd can be pumped without damage thanks to the specially designed lobes. The pump is authorized to carry 3-A symbol. Note: Consult the options of the pumps authorized to carry 3-A symbol. The SLR pump is a bare shaft rotary lobe pump. 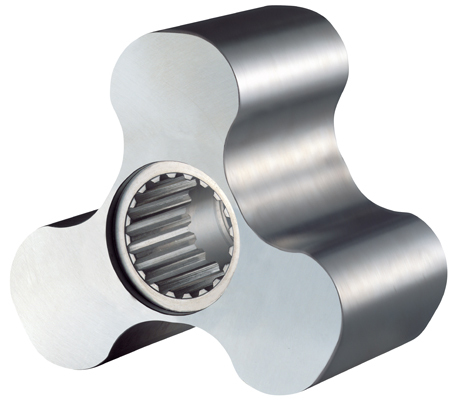 It is made of a cast stainless steel pump casing and cover, and tri-lobe rotors with sanitary attachment. The SLR rotary lobe pump is provided with an external single mechanical seal, C/SiC/EPDM. The seal is balanced and has a hygienic design. When required, other materials can be used. 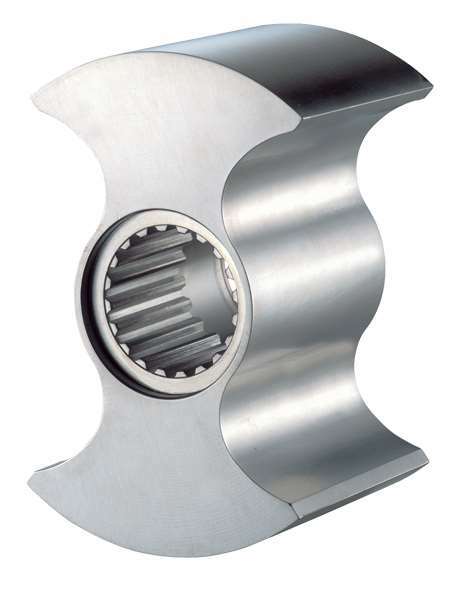 Mechanical seals: SiC/SiC or TuC/SiC. flushed mechanical seal (quench), double mechanical seal, lip seal (FPM or PTFE), gland packing, O-ring. Relief valve on the front cover or external by-pass. Various kinds of drives and protections (gearbox drive with optional frequency converter, pulley/mechanical drive speed selector). Connections: Clamp, SMS, RJT, etc. Summary La pompa SLR è una pompa lobulare rotativa di spostamento positivo e di disegno sanitario per installazioni nell' industria lattiero-casearia, delle bevande, cosmetica, farmaceutica e chimica fine. Summary SLR pumpen er en loberotor pumpe med positiv fortrængning og et sanitært design velegnet til anvendelse i mejerier, føde- og drikkevare industri samt farmaceutisk og kosmetisk industri. Summary El bombeo de chocolate (así como sucédaneos, cremas y pastas de cacao) puede llegar a ser un proceso delicado, por lo que hay una serie de factores que deben tenerse en cuenta. 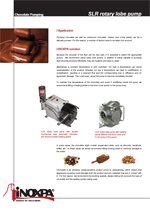 Summary Pumping chocolate (as well as compound chocolate, creams and cocoa paste) can be a delicate process. For this reason, a number of factors have to be taken into account. Summary Las bombas lobulares Hyduty y Hyclean de INOXPA forman parte de nuestra extensa gama de bombas rotativas de desplazamiento positivo para líquidos viscosos. Summary The Hyduty and Hyclean lobe pumps by INOXPA are part of our wide range of positive displacement rotary pumps for viscous liquids. Summary Les pompes à lobes Hyduty et Hyclean d’INOXPA font partie de notre ample gamme de pompes rotatives à déplacement positif pour les liquides visqueux. Summary Le pompe a lobi Hyduty e Hyclean di INOXPA fanno parte della nostra ampia gamma di pompe rotative a capsulismo per liquidi viscosi. Summary Hyduty og Hyclean loberotor pumper fra INOXPA er en del af vores brede program af positive fortrængnings loberotor pumper til viskøse produkter.